New York City ... why again didn't I bring my camera? Ah yes, hardly 3 business days, 2 nights in a hotel - the Marriott Marquis at Times Square - being stuck in a trade show all day, there certainly wouldn't be any time for taking pictures. Glad I had at least my iPhone 4, so I was able to take a few memories home, like the view from my hotel room window, and some street scenes a few blocks from Times Square. These being iPhone photos, I had to brush them up a little in LightRoom to make them more interesting ... see for yourself. A few blocks from Times Square. 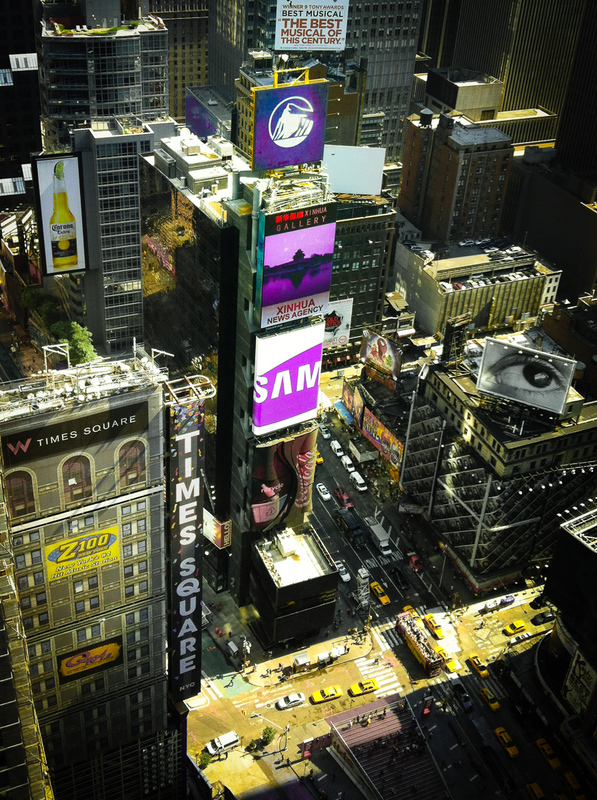 Times Square. I didn't venture far out. My office building in my home city, Cologne, Germany, offers great views of the city and the countryside around. However, being the only highrise in the neighborhood, it is also a nice subject all by itself. For these shots, I waited for the sun to set. 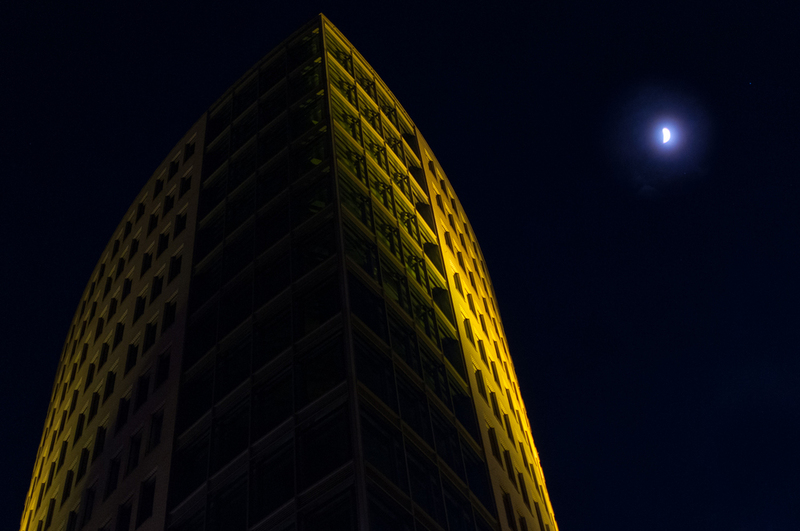 The night was slightly overcast, but the half moon provided a nice balance to counter the building. In particular, the contrast between the cold blueish cast of the moon and the warm, incadescent cast of the illuminated high rise adds some drama. These shots were taken with a D300, a 35/1.8 lens, hand-held. 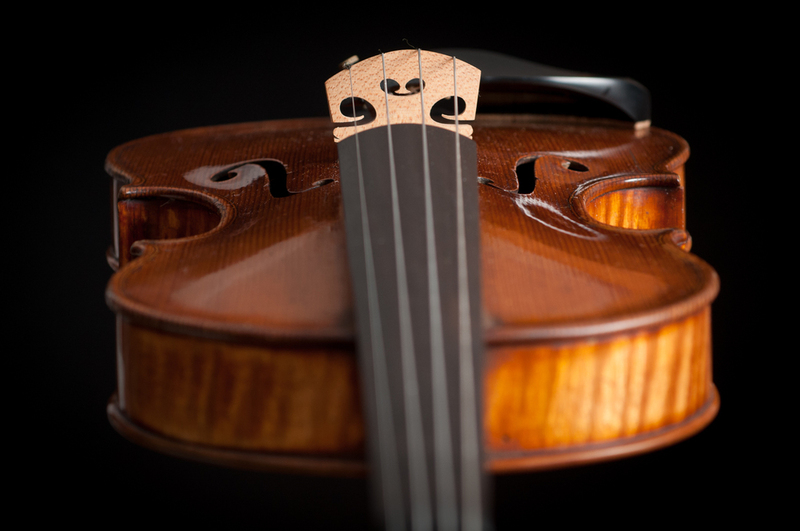 I recently had my violin maintained at the local violin maker shop, and when I picked it up I was startled by how pretty she was - varnished, polished, cleaned. She's about 150 years old, so I think she deserved a little maintenance. I played a little, but then I couldn't resist the urge to take some photos. I put up a single light source - a flash shooting through a white umbrella -, a black backdrop, and some styrofoam to shield the backdrop from the light source. Then, the scary part - suspending my violin with a thin, black thread from a stand. Removing this thread would later be the only post-processing in Lightroom. First, I started with some traditional shots that served mainly to document the instrument. Front, back, side, with nice, saturated lighting and mild shadows - nothing dramatic - trying to prevent stark reflections. Once that was done, on to the more interesting part. When you play the violin, you have a certain perspective, watching over the bridge to your fingers on the fingerboard. I tried to capture this in the following photo. (Oh, and of course I added a little drama by adding some vignette). FInally, the flying violin, hovering in the air. How she's doing that? I have no idea. (Well, actually I do know ... I was holding her scroll in my left hand, and the camera in my right hand ...) What I do know is that it's important to always have the f-holes and the bridge in focus. They're like her eyes and nose. If you're interested in technical details - these shots were made with a Nikon D300, a Nikkor AF-D 60/2.8 Macro lens, at f=1/5.6. 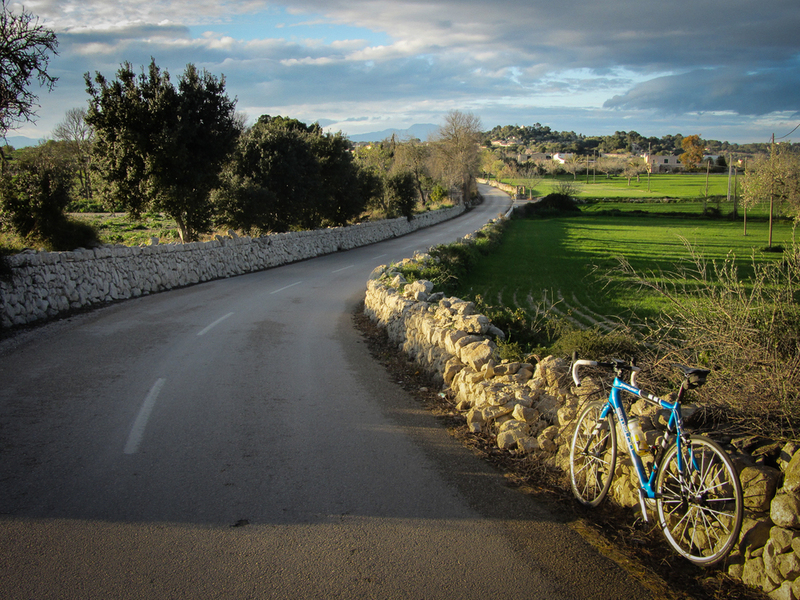 Year after year in February, March, and April, Mallorca, a Spanish island in the Mediterranean, is invaded by thousands of ambitious cyclists. They cherish training in a beautiful landscape that is characterized by medieval villages, orange and citron orchards, mountains and rolling hills, and almond trees in full blossom. I'm one of them (one of the cyclist, that is). When riding for hours on a road bike with no more than a bottle of water, 2 or 3 power bars, and a cell phone, bringing a DSLR with a handful of lenses is of course out of question. This is when your little point and shoot, no bigger than a smartphone, comes in handy. 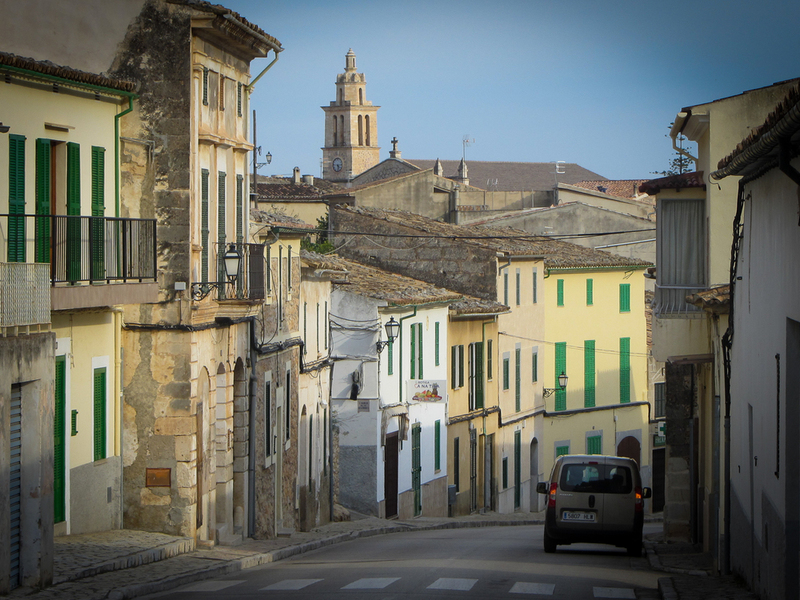 Caimari, a little village at the bottom of the Serra de Tramuntana, the mountain range in the western part of the island. The islanders are used to cyclists; in fact, an entire system of small country roads is mainly maintained for their benefit. Cars are merely tolerated. Somewhere in the south east. The ubiquituous almond trees. If you want to see them in full blossom, you have to get here early - no later than February. 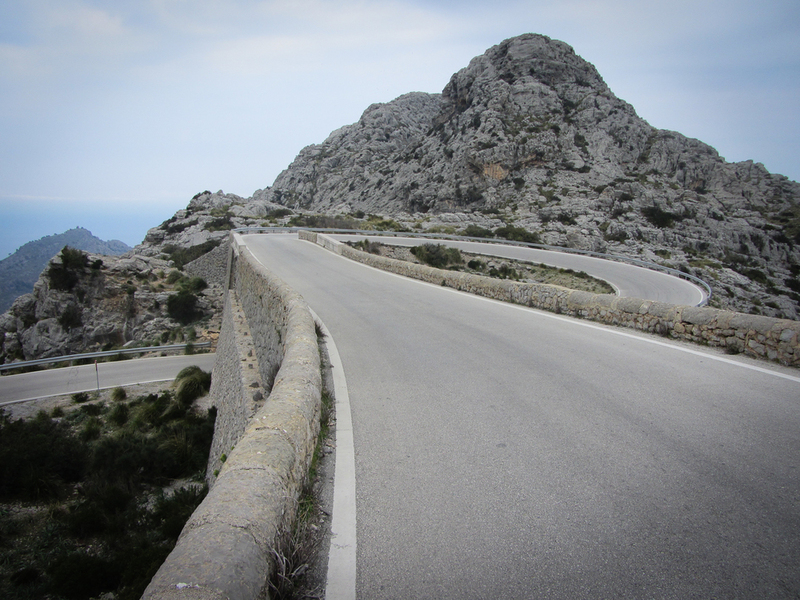 A famous part of the road in the descent to Sa Calobra. A cyclist's dream road. 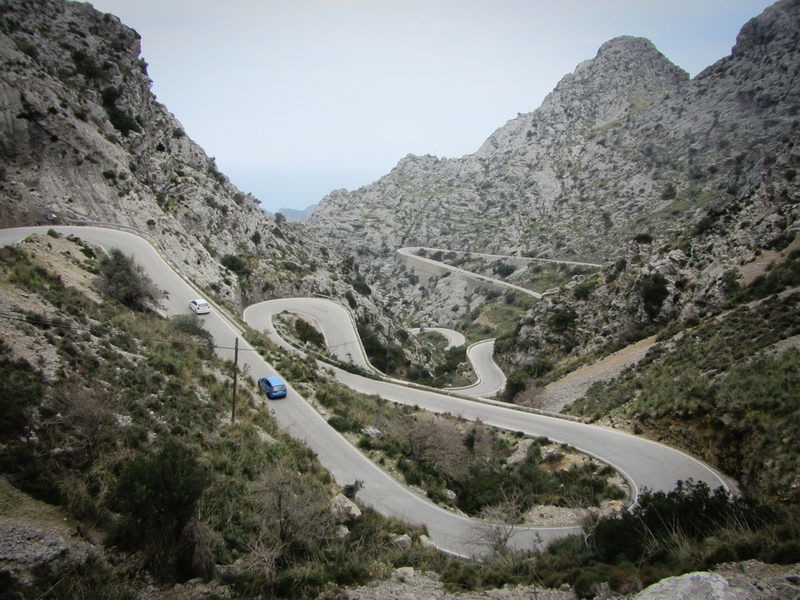 Almost 10 km of winding asphalt, descending from the mountains, 700m above sea level, to a sea port - Sa Calobra. And of course you'll have to climb the same road on your way back, because it's a dead end. In the summer, this road is jammed with tour buses that angle around the narrow serpentines; in February, however, the road is still almost exclusive to cyclists. It's going to be colder tomorrow. Clouds over the Serra de Tramuntana. Overcast sky, late in the day but still no sunset ... yet, you find yourself in front of a landmark building. What can you do? 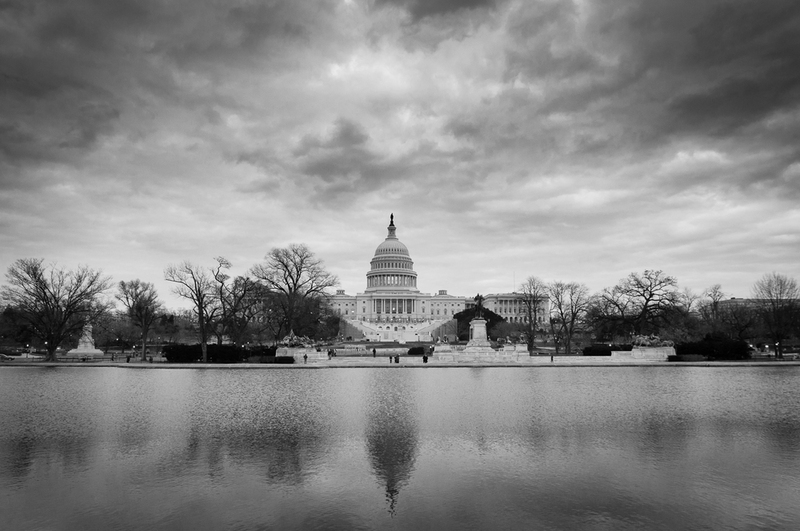 For one, check if there's a reflection pool - and get behind it. Next, take your picture. Finally, use some creativity in Lightroom ... and voilà, you're there. 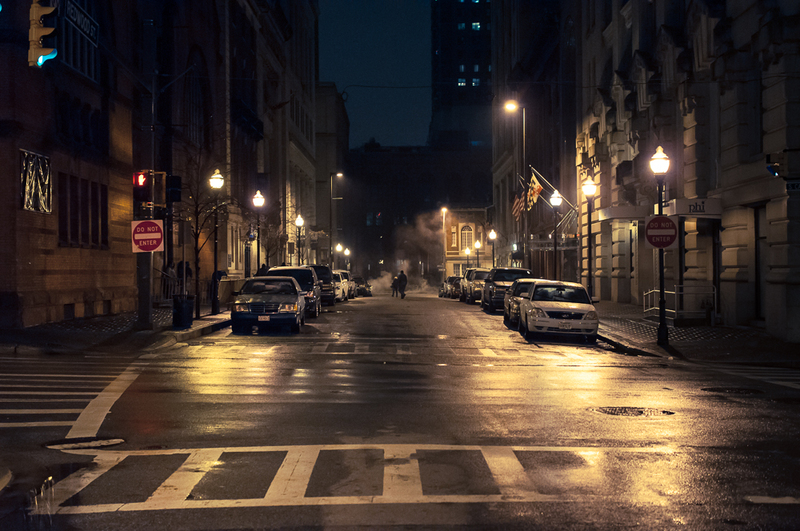 Taking a walk through downtown Baltimore on a cold, rainy winter night is an experience that gets you as close to a "The Wire" mood as it gets. (And in the improbable case you haven't seen that show, do it now. Go.) 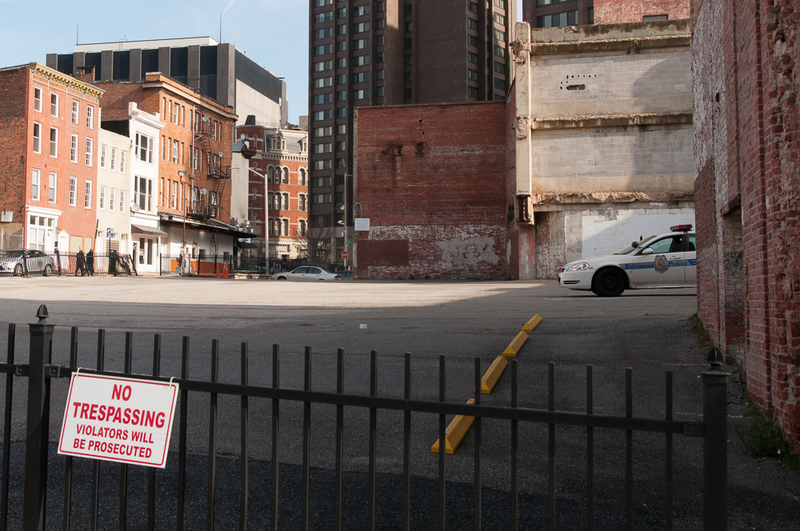 Baltimore downtown is one of those places where every building seems to have history, a story to tell. This place isn't fake, it's real. And the steam coming out of the sewage system, incandescant street lamps, police cars at every corner ... all this does a great job of creating an eerie atmosphere. In case you're interested in technicalities ... the night pictures were taken with a D300 and 35/1.8 lens. Baltimore during the day has lots of atmosphere, too. To get to first picture below with the graffiti on the wall, one has to climb onto an abandoned parking lot that was closed to the public.